I have been asked how to combine and create lengths of Marianne lace, so I decided it would be best to show you in my blog. Firstly I must apologise that it was impossible to combine GFE_MRN_1_32 and GFE_MRN_2_12. What I had not realised was that the first design needed to be flipped horizontally so that the open end would fit on to the other design, either top or bottom. Below you will see how once flipped it will fit the corner design. 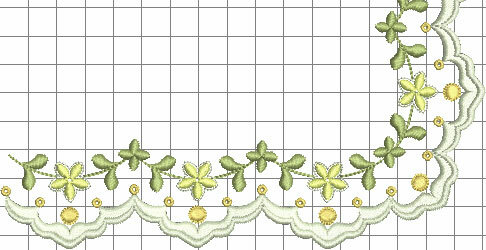 Here you can see the 2 designs brought into my Embroidery software. The corner design does not have the gold circle at each end so it must feature on the design which is being combined with it. 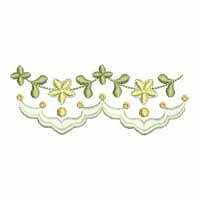 The small four petaled green flower will overlap the stem as well to complete the design. Carefully move the design on the left to place it correctly against the corner design. 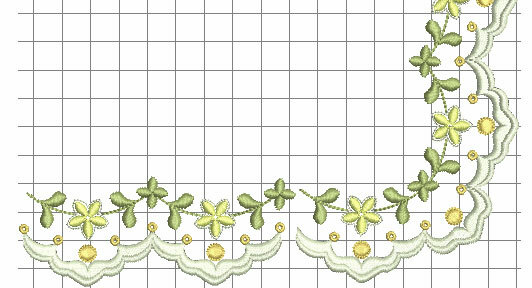 Very soon I shall be releasing Marianne 3 and that will have a longer length of lace for you to combine making the embroidered lace easier. 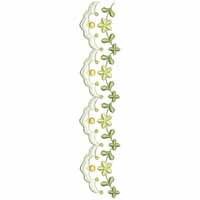 I will shortly be creating some lace using these designs and will upload pictures and instructions on doing that along with combining the designs in your embroidery software! 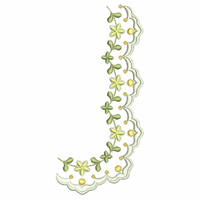 The amended design file for Marianne 1 will be sent out to everybody, in the next few days, who purchased the set. In the meantime I hope these few instructions will give you an idea of how to create the lace. Please email me if you do not receive the design by November 2oth. Thank you Maggie. I want to teach how to make a real embroidery techniques that will give confidence and be useful for other projects. See you if you are able at the AEC, Florida, May 2014!